Where did Egypt’s former president Morsi go wrong? In Egypt one usually gets one of two answers: he did not go wrong, or he did not do anything right since day one. Extreme political opinions in this case are often the ones that attract the attention while the others get lost in the shuffle. One year on since the Islamic president Morsi was ousted, the lessons need to be extracted and explained so that mistakes might not be repeated by any future leader. Nature of the leaders of the Muslim Brotherhood (MB). Throughout the latest years of former president Mubarak’s regime, his main challenge was the Muslim Brotherhood; the banned movement was the strongest on the ground, the most organized, and the most popular among his opposition. Mubarak was able to mobilize all state resources to discredit the movement, starting from the detention of members and leader, confiscation of property and wealth, and down to mass media campaign. It even reached to the level that a full TV series was produced about the movement to draw an evil face for it. The only term used in official media to describe the movement was “al-Mah’zoora” (the banned group). This campaign did, for sure, leave a number of Egyptians with at least big questions about the MB, if not a negative stance. Mubarak’s strong media tactics were resumed after the Jan 25th Revolution at the hands of the fulool (remnants of Mubarak’s regime). Facts are astonishing about how much the fulool are willing to spend in order to end the rule and influence of the Islamic party. At least 25 new satellite channels were established since the Jan 25th Revolution, with the government’s loosened restrictions. At the same time, the revenues out of advertisements have decreased to at least 40 percent, compared to the pre-revolution period, media expert Yasser AbdelAziz told Al-Sharq Al-Awsat. What is important to note is that the overall revenues of the private Egyptian satellite channels is about 1.5 billion LE, while they spend about 6 billion LE, according to the former minister of Media Salah AbdelMaqsood. As to say, on annual basis they lose billions. This fact raises the question about the reason why those channels remain in business despite their heavy financial loses. The fulool businessmen realized after the Jan 25 Revolution the importance of public opinion in shaping political events and decided to sacrifice some money to gain back their lost clout. Fruits reaped on June 30th with the masses that took the streets to overthrow the MB-candidate President Morsi. The equation was clear for the fulool with media arms, create a public feeling — regardless of its accuracy — that Morsi was taking the country to a black hole, a civil war as about to take place, and that he was selling off the country by blindly obeying the MB’s Supreme Guide Mohamed Badie. Their success in selling this to big numbers of Egyptians proved the undisputed influence of media in shaping public opinion and thus reshaping political landscape in the post-Jan 25 Egypt. On the other side, former president Morsi, while in power, did minor, if any, effort to counter such aggressive interference of media in the political stability of the country. His actions were a proof that he was willing to sacrifice his personal image for the sake of applying the constitution and rule of law in terms of freedom of expression and speech. But such grave mistake cost him his presidency. . The money of the fulool was not only directed towards media, they worked hard during the first year of Morsi’s reign to cause turbulences that would help bring down his support among Egyptians and cause his control over the state to be even weaker. Sit-ins, demonstrations, and criminal acts were orchestrated, in addition to made-up crises in the supply of gas and electricity, all of which vanished in less than 24 hours as soon as the military coup took place and ousted Morsi. The subversive acts would not have taken place wasn’t it for the influential connections the fulool had inside almost every government institution where some employees were indebted to Mubarak’s regime, with some who could be bought off easily with money or threats of scandals. Morsi and the MB were well aware of such crisis, yet their solution was far from practical. There was always a dichotomy that Morsi and the MB thought through in terms of the solution, either to be thawri or islahi or, i.e. be revolutionary in cutting of the fulool’s connections or use gradual solutions. The dichotomy was lethal because either of the two options was catastrophic to building the post-Jan 25 Egypt. A revolutionary path by Morsi would mean that there would not be institutional and constitutional building for the country as revolutionary policies tend to be swift and destructive for what’s already established while gaining the president enemies in a fast pace. On the other hand, an islahi path of gradual eradication of corruption would normally lead to very slow pace of change in a time where people were expecting too much in very short time. Unfortunately, Morsi chose the latter and depended much on practicing policy as in the books, not as his political rivals would do it. Consequently, the opposition, which included the fulool and a lot of other groups, was able to have a free space to act and proceed with its plan to bring down the regime. 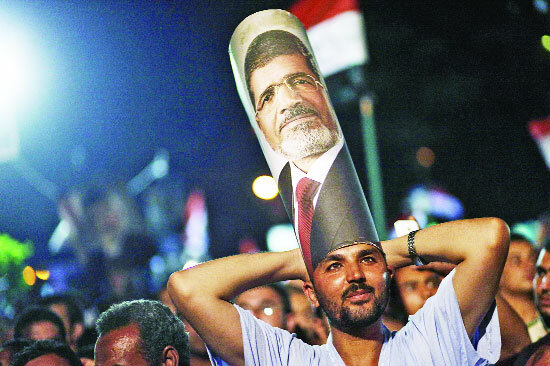 At the same time of applying an islahi path, Morsi was getting involved in battles that should have been postponed. In other words, he was opening up fronts and not taking revolutionary actions to win those new battles, thus ended up fighting a number of concurrent battles with the fulool, judiciary, and military — to name some — and no swift action taken in any. Although Egyptians elected him for office, president Morsi was accompanied by the MB in the presidential palace. Theoretically, in a democratic system, presidents usually run through parties, and those parties are expected to support the president in his term; also, theoretically, the MB is the most popular and strongest civilian group in Egypt. Hence, the MB’s support for Morsi is a must and was expected to happen, which was not the main problem in this relation. The main problem in the support of the MB to Morsi was about the way the MB leaders think and act politically. As explained above, the movement was banned and fought under Mubarak, and even throughout its history, since its establishment more than 80 years ago. Such constant battle with the consecutive Egyptian regimes created a trend in the movement that is more leaning towards making the movement a “closed society” with a big deal of secrecy in their work. Following from this was a mindset among some of its prominent leaders that mistrusted all others, including other Islamic movements. When Morsi came into office, this trend seemed to be the dominant one in the MB’s leadership, which made the closed society mentality reflect in their political actions while supporting the president. Consequently, parties, individuals, and groups that should be natural allies with the MB were marginalized, and only those trusted by the movement — something that was too hard to gain — were allowed to have their opinions taken seriously. Key people helping the president to formulate his policies, therefore, turned out to be MB members or affiliates. And because most of the MB members had no government or policy making experience before, the quality of those aiding the president, with some few exceptions, was not up to expectations, to say the least. With some months into office, more and more groups being marginalized by the MB, the president was left alone to fight the above mentioned battles. Some signs of improvement were visible later on, with the circle of trust being widened an inch, yet it was too late. Inclusiveness is a lesson the MB should have learnt early on as something crucial in the political game. One reason that I am writing about those grave mistakes is the fact that the game is being played elsewhere in the Arab and Muslim worlds, and unless the lessons are drawn from this important experience, the same failure will be repeated again and again.